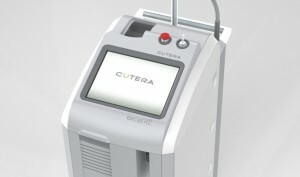 Cutera presents the Excel HR laser machine, the new gold standard in safe and effective aesthetic lasers. The Cutera Excel HR offers the powerful combination of a high powered 755 nm Alexandrite technology with the highly versatile 1064 Nd:YAG laser and amazing cooling technology. The result is the most comfortable tool for effective laser hair removal. The Excel HR utilizes Alexandrite technology, the Gold Standard in reducing hair growth permanently in skin types I-IV. This powerful laser system utilizes a high peak power level and optimized pulse width in order to maximize hair follicle targeting. The results are impressive, with energy that can penetrate deeply into each follicle while delivering powerful cooling benefits to the patient. Patients can enjoy fewer risks of side effects typically associated with this type of service, and fewer occurrences of swelling or pain at the treatment site. Featuring a sleek, modern design and a comfortable ergonomic shape, the Excel HR has a footprint that is 70% smaller than other handheld laser machines. The Excel HR doesn’t produce any Chlorofluorocarbons (CFCs) or produce or require consumables or disposables for operation. This means zero costs per treatment and zero cost for replacing flashlamps. When you are looking for a highly efficient laser machine that produces outstanding results and the highest level of patient comfort, the Excel HR from Cutera is a smart choice. Experience the benefits of improved hair reduction efficacy using less fluence. With improved targeting of laser energy, you and your patients will notice a difference. SunrayLaser.com has amazing deals on used Cutera Excel HR laser equipment with savings that are up to 60% off the original price! See for yourself how much you can save on high quality used laser equipment when you buy from SunrayLaser.com. Looking for pricing information and other details about our selection of preowned Cutera Excel HR equipment? Please fill out the form below and we’ll provide a fast and free, no obligation quote. It’s an easy and no-risk way to learn more about this outstanding line of cosmetic laser systems.